Last month’s 5.8 magnitude earthquake in Virginia that rocked the North Anna nuclear power plant – which has remained shut down since – was found by federal regulators to have produced twice as much shaking as the plant was designed for. The North Anna Plant’s two reactors shut down immediately after the August 23 quake and the plant lost offsite power – just as happened at the Fukushima Daiichi plant after the March earthquake in Japan – and three of four diesel backup generators to cool the reactor cores kicked in 10 second later. A fourth generator failed, but a back up battery was tripped to compensate, something both Dr Michio Kaku, an American theoretical physicist and Bellona’s nuclear physicist Bøhmer say is a very dangerous situation given the very limited 4 to 8 hour capacity of most US reactor back up batteries. The offsite electrical failure was traced to the failure of relays on three offsite electrical transformers. Power was eventually restored to the North Anna plant several days later, but it remains offline. The North Anna plant was cited as being seismically vulnerable in a study last year by the US Nuclear Regulatory Commission of 27 US east coast nuclear power plants. Parts of the plant, located in Mineral, Virginia about 17 kilometres from the epicenter of the earthquake and 100 kilometres southwest of Washington DC, was found by NRC investigators to have endured jolts of 26 percent the force of gravity, or 0.26 g. A “g” is a unit of measurement for the force of gravity. An NRC document indicates that the North Anna plant is built to withstand 12 percent the force of gravity, or 0.12 g, the USA Today newspaper reported. Dominion, the plant’s operator, says parts of the plant can handle up to 0.18g. The NRC measures the acceleration of gravitational forces because it is concerned about how strong quakes are at nuclear reactors, not at the quake’s center, said Roger Hannah, an NRC spokesman. “It’s the things inside the buildings that may have been shaken more than the design called for,” Scott Burnell, another NRC spokesman told USA Today, adding the buildings themselves appear to have been less affected. He said the analysis is based on a seismograph reading taken about 48 kilometres away by the US Geological Survey. “Maybe you shouldn’t rely on the margin,” Edwin Lyman at the Union of Concerned Scientists, a non-profit critical of nuclear energy, told the paper. “The jury is still out,” he said, on whether the plant was adequately designed. The two reactors at the North Anna plant, which began operation in 1978 and 1980, have remained closed since the Aug. 23 quake. Dan Stoddard, Dominion’s senior vice president of operations, said Friday that initial readings from the facility’s scratch plates and other monitors indicate its shaking during the quake exceeded its design, but he declined to give numbers. 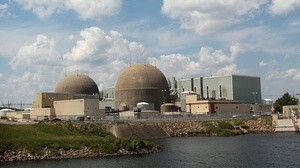 Dominion officials plan to brief the NRC today on those findings. Stoddard told ABC News that cosmetic cracks had been found in the reactor buildings and that 25 of 27 vertical casks holding spent-fuel assemblies – each weighing 115 tons moved up to 4.5 inches. Low-level radioactive waste spills from heavy casks were a problem at an earthquake and a nuclear incident during a 2007 earthquake in Japan that struck the Kashiwazaki-Kariwa plant, the world’s largest. Some 1,200 litres of radioactive water sloshed out of their cement containers, releasing radionuclides into the environment. “The plant is safe,” he told reporters, adding all radiology readings have been normal. He said it will be operational again once inspections are complete. The NRC sent in an augmented inspection team that’s slated to continue its work through this week. While Bellona’s Bøhmer has noted that it is safe enough to run back up power temporarily to keep reactor cores cool. But real problems emerge, especially for the US, when back up batteries have to be relied upon. According to the Union for Concerned Scientists’ Lyman, only 11 of America’s 104 reactors have back up battery power that would last eight hours. Ninety-three reactors have power that would last only four hours. Days following the quake, the US eastern seaboard was pelted by Hurricane Irene, which resulted in two reactor scrams during the high winds of the storm. Bellona’s Bøhmer called on the US to have a hightened sense of awareness of natural forces that could damage American reactors. Between a rock and a hard place: How will US nuclear power compete with cheap shale gas?